I have obnoxious neighbors that think its funny to use offensive words for their SSIDs. I would like to remove those SSIDs from, at a minimum, the wifi menubar icon. If its easier, hiding/removing them from the OS completely (menubar icon and system prefs) would be acceptable. I'm an OS X newbie, so I don't even know where to start with this. I prefer built-in solutions (read: free), but solutions < $10.00 would be ok too. You could place something like this Applescript in you Applescript Menu and use it to list you preferred networks, choose on and connect to it. Using the same idea above, you could also create a banned list of bad ssids. The main command is using a airport framework command instead of the networksevice command so is a tad slower. But scans for available networks instead of just you preferred. I am not sure if you can directly filter SSIDs from that list. However there are a couple ways to hide the Wifi icon from the bar. Click on the icon -> "Open network preferences" --> Bottom of that window is a checkbox. "Show Wifi Status in Menu Bar". The other option, would be to use an application like Bartender. It cost money, but will let you hide/rearrange the top bar. If you're just trying to hide the dialog from your children, then those two options should be good enough. Maybe the best option would be to create an Automator/AppleScript to join each of the networks you have to jump between. You could create your own Application or Service for the networks you use often, and use your System Preference pane for when you are in a different location and need to join Wifi. Depending on your scripting ability, you could use one Workflow/Script with some logic to toggle between networks based on which one you're currently connected to. Not the answer you're looking for? Browse other questions tagged macos mavericks wifi software-recommendation . What's the terminal equivalent of Windows' netsh wlan add filter? How do I completely ignore a wireless connection? 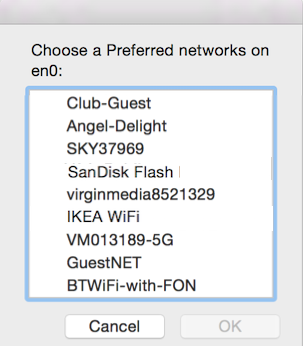 How do I prevent my mac's wifi from ever (not just once) seeing a particular wifi network? How can I remove the “Eject” icon from the menubar? How to remove passpoint wifi network on iphone?